At least 115 fighters of the militant Islamist group al-Shabab have been killed in heavy fighting with pro-government forces in northern Somalia, the regional government says. A further 110 militants were captured during the fighting, the Galmudug government added in a statement. There has been no independent confirmation of the claims. 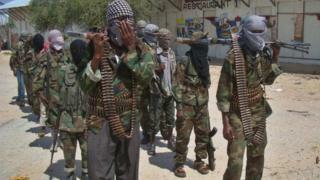 The al-Qaeda-linked militants have drifted north after losing ground in southern and central Somalia. Galmudug's President Abdikarim Hussein Galaud said the security forces were determined to "wipe out" the militants, and to prevent them from establishing bases in stable parts of the north. The militants were defeated after four days of fighting along Galmudug's border with Puntland, the government statement said. A few of them managed to flee into rural areas, it added. The African Union (AU) has some 22,000 troops battling al-Shabab in southern Somalia, where it was formed nearly a decade ago to fight for Islamic rule. Last month, the militants overran an AU base in the southern town of el-Ade. Somalia's President Hassan Sheikh Mohamud said about 180 Kenyan troops, which were part of the AU force, were killed in the attack.